Directions (1-5): Study the following information carefully to answer the given questions: Seven persons P, Q, R, S, T, U and V attend the meeting in a week from Monday to Sunday. Each one of them likes different colour such as Red, Green, Yellow, Pink, Brown, Orange and Blue but not necessarily in the same order. More than three persons attend the meeting between P and the one who likes Yellow. T attends the meeting immediately after the one who likes yellow. Only one person attends the meeting between T and the one who likes Red. T attends the meeting after the one who likes Red. Two persons attend the meeting between U and the one who likes Blue. As many persons attend the meeting before U is same as many persons attend the meeting after V. U does not like Yellow. Only one person attends the meeting between V and the one who likes Pink. R attends the meeting immediately before the one who likes Green. S attends the meeting before Q. P does not like Orange. Q does not like pink. S attends the meeting before the one who likes pink. R attends the meeting immediately after Blue. 1. Which of the following person likes Green? More than three persons attend the meeting between P and the one who likes Yellow. T attends the meeting immediately after the one who likes yellow. Only one person attends the meeting between T and the one who likes Red. T attends the meeting after the one who likes Red. Two persons attend the meeting between U and the one who likes Blue. As many persons attend the meeting before U is same as many persons attend the meeting after V. U does not like Yellow. Only one person attends the meeting between V and the one who likes Pink. R attends the meeting immediately before the one who likes Green. S attends the meeting before Q. P does not like Orange. Q does not like pink. S attends the meeting before the one who likes pink. R attends the meeting immediately after Blue. Case 1 will be dropped because only one person attends the meeting between V and the one who likes Pink. 2. 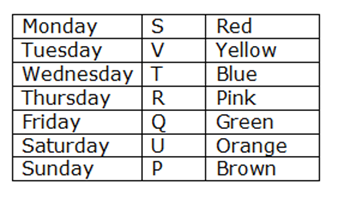 If S is related to Tuesday, T is related to Thursday, in the same way U is related to which of the following? 3. How many persons attend the meeting between R and the one who likes Brown? 5. Which of The following person attends the meeting immediately after R? Eight boxes K, P, L, H, D, S, W and Q are arranged one above the other but not necessarily in the same order. 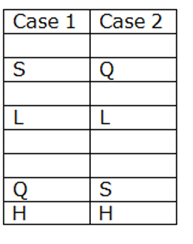 Four boxes are kept between Box S and Box Q. Neither Box S nor Box Q kept at top or bottom. Three boxes are kept between Box L and Box H. Box L is kept above Box H. Box L is not kept at top. As many boxes kept above Box K is same as below Box W. Box D is kept below Box K. Less than three boxes are kept between Box P and Box S.
Four boxes are kept between Box S and Box Q. Neither Box S nor Box Q kept at top or bottom. Three boxes are kept between Box L and Box H. Box L is kept above Box H. Box L is not kept at top. 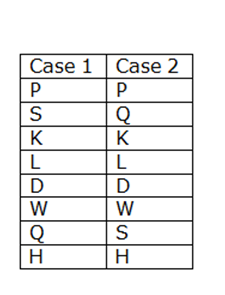 As many boxes kept above Box K is same as below Box W. Box D is kept below Box K. Less than three boxes are kept between Box P and Box S.
Case 2 will be dropped because less than three boxes are kept between Box P and Box S.
7. How many boxes are kept above Box S? 8. Which of the following box is kept immediately below Box Q? 9. If all the boxes are arranged alphabetically from top to bottom, then how many boxes remain unchanged? 10. How many boxes are kept between Box L and Box Q? Seven persons P, Q, R, S, T, U and V attend the meeting in a week from Monday to Sunday. Each one of them likes different colour such as Red, Green, Yellow, Pink, Brown, Orange and Blue but not necessarily in the same order. 1) Which of the following person likes Green? 2) If S is related to Tuesday, T is related to Thursday, in the same way U is related to which of the following? 3) How many persons attend the meeting between R and the one who likes Brown? 5) Which of The following person attends the meeting immediately after R? 7) How many boxes are kept above Box S? 8) Which of the following box is kept immediately below Box Q? 9) If all the boxes are arranged alphabetically from top to bottom, then how many boxes remain unchanged? 10) How many boxes are kept between Box L and Box Q?